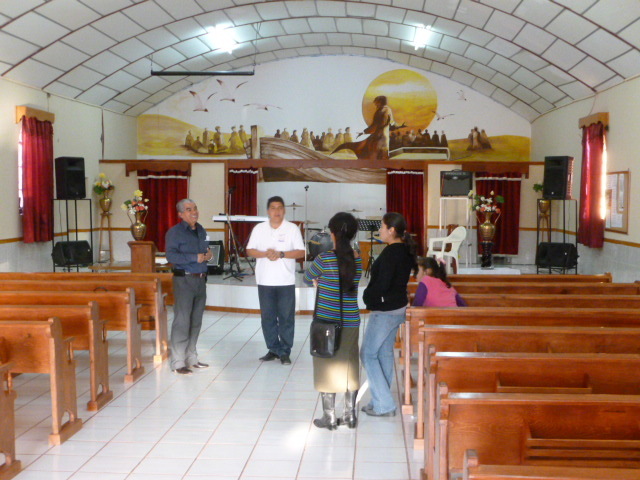 Pastor Josue Martinez, in white shirt, with wife Ruth and daughter Sarid visit with Pastor Rosendo Arvizu and wife Olivia in the Maravillas sanctuary. Mural was painted by Caleb, Rosendo and Olivia’s son. 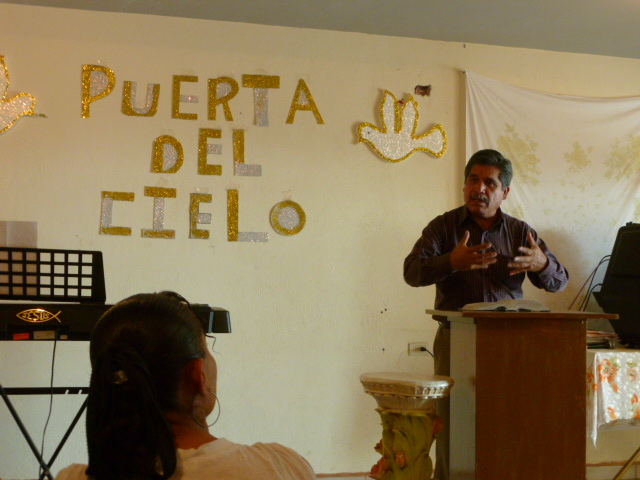 Is there another place in the world where one can worship in El Porvenir – “the future” – one Sunday and the next Sunday praise God in Maravillas – “the wonders”? Doug began his sermon with that question a week ago in the Maravillas Disciples Chuch, the congregation closest to the seminary grounds where we live. It was, he noted, a challenge to preach in a community that called itself “the wonders”. The church in Maravillas is justifiably proud of the social hall, education wing and sanctuary buildings they have built in the last 25 years. 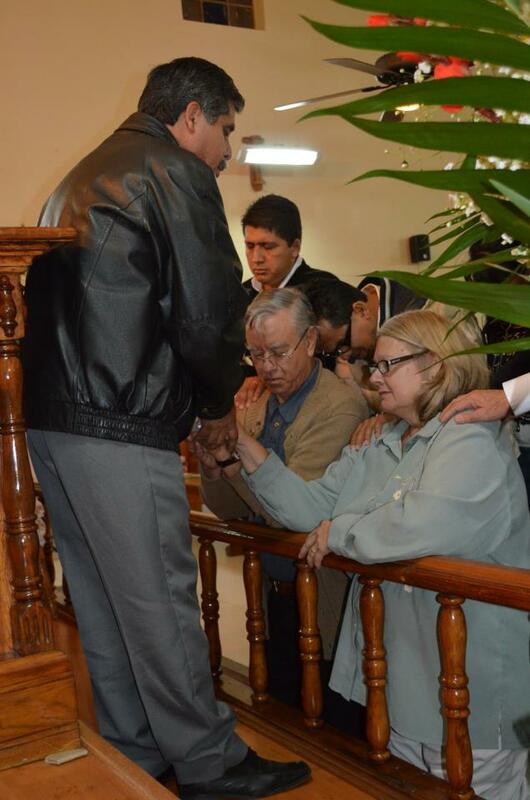 Pastor Rosendo Arvizu and his spouse Olivia lead a congregation whose schedule every Sunday begins with Sunday school and morning worship followed by a meal before concluding with another worship service. Kate and Doug brought an appetite along with our admiration for such a congregation. the wreckage, but each had been protected in one way or another. A member of the congregation provided the funds to help clear the rubble and demolish what remained of three of the walls. 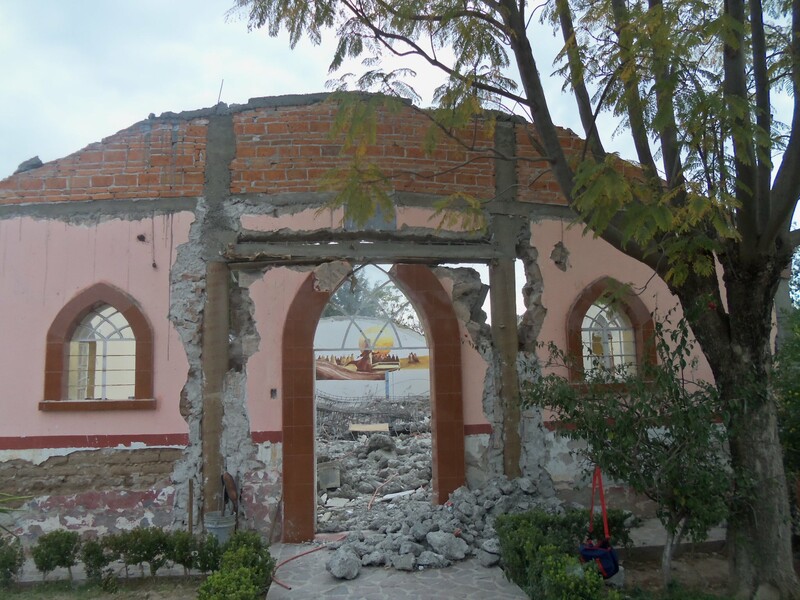 In spite of the realization that all of the money raised for the project had been spent, there was confidence they would rebuild an even lovelier, larger sanctuary. The congregation’s fast recovery from the shocking loss was due in part to the assurances of forthcoming aid from the CICE group of Disciples congregations led by Pastor Josue Martinez. An offering for the rebuilding of the sanctuary is being collected among the CICE churches. On the day we preached in the two services, representatives of another CICE church were present in the afternoon service to pledge their support and prayers. Rev. Felix Ortiz, Disciples/UCC Executive for Latin America also has responded quickly to the Maravillas congregation’s loss. In his response message to Josue, Felix thanked God that none of the 8 workers on the roof was injured. He then shared the information that a specialist in construction projects in the U.S. was ready to assist in the design and planning of the new sanctuary building. In the sermon Kate preached following lunch, she reminded everyone of the promise found in Romans 8:28 that all things work together for good for those who trust in the Lord. Even in the worst circumstances, God can help us to find growth and become stronger. God is with us always, accompanying us in the hard times and the good. Alvaro, Kate’s interpreter and youngest son of Pastor Rosendo and Olivia, commented after worship that the congregation felt God was providing an opportunity for them to become a more spiritual and inspired church. We expect to follow the progress of the Maravillas project and will keep you informed of new “wonders” in that community. In the meantime we know the congregation continues to raise the roof of their social hall and kitchen by their praise singing in worship. And we know they will continue to enjoy their Sunday meal shared “picnic style” outdoors on the church grounds. And that construction volunteer, “Santiago” Jim Piper, who arrives tonight from Caldwell, Idaho, will enjoy sharing the meal with them. Visited a total of 26 churches in the states of San Luis Potosi, Aguascalientes, and Zacatecas. Guadalajara in a 2003 Nissan X Trail purchased by Global Ministries for the work of the Mesa Conjunta. The Disciples of Christ and Congregational Churches of Mexico formed the Roundtable about 7 years ago to work together on education and mission programs. Our assignment here is to support the aims of the Roundtable under the title of “Consultants in Mission Development”. So naturally our first task is to get to know the churches and leadership of the participating denominations. We now consider the Presidents of the two Disciple denominations and their families as friends. The President of the Congregational Churches, Pastor Domingo Guerrero, will accompany us on the visits with his churches this month. Disciples of Christ churches here are on the move and growing in number. The Disciples Yearbook of 1991 reported a figure of 29 churches affiliated with the Disciples in Mexico. The two Disciples denominations participating in the Roundtable now count 55 churches. Among the new churches are several begun in the homes of members of established churches. 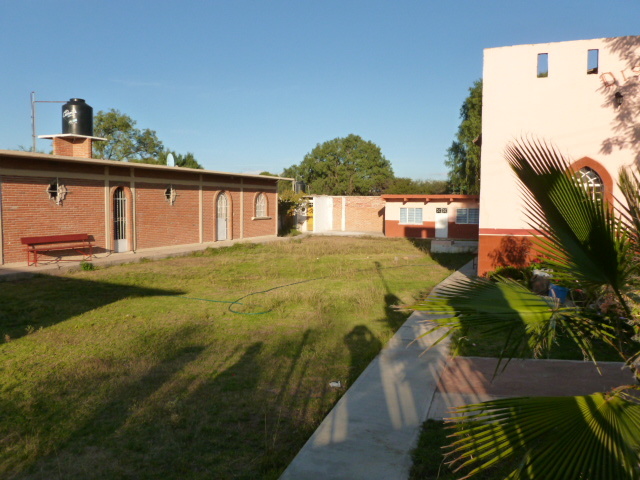 Two churches in both Aguascalientes and San Luis Potosi can claim more than one church plant and churches with members currently serving as pastors. Leadership development and pastoral education have been the priorities of the Roundtable to date. Their “Summer Session” last year provided a week of classes in areas such as “The Family in Crisis” and “Post Modern Developments in Theology”. At the next Roundtable meeting this month in Guadalajara the top agenda item will be planning this year’s Session. We feel very fortunate to be serving with the Mexican partner churches of our Division of Overseas Ministries (now referred to as Global Ministries) as “long term volunteers”. New friendships, new growth in ourselves and much new learning are cause for thanksgiving as we look back on the last three months. And we both have made progress in our Spanish. Gloria a Dios! Que Dios los bendiga a todos ustedes! 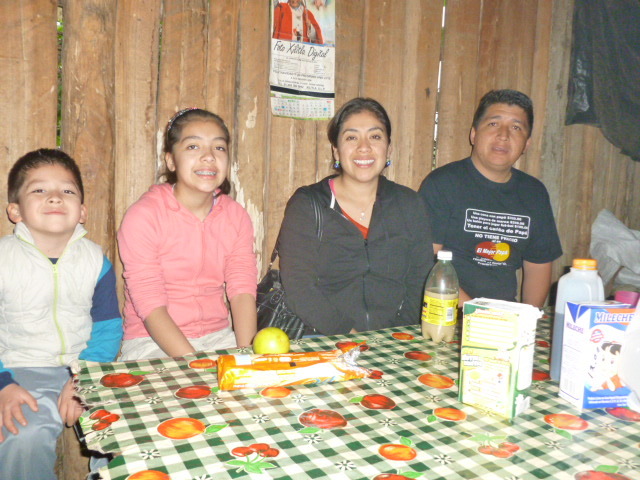 Debbie on left and Nadia in middle are daughters of Pastor Rogelio Lopez of Julien Carrillo Disciples Church in SLP. Photo taken by wife Heidi.